We've been so fortunate to assemble a team that shares our passion for contemporary fashion. As we've shown in our stories here on The Assemblist, community is a huge part of what we do here at Brand Assembly. Today's catch up with our Business Development Manager Anna Bateman really embodies this idea. As one of our newest team members, Anna brings a unique perspective to the table when it comes to fostering the success of our emerging designers. 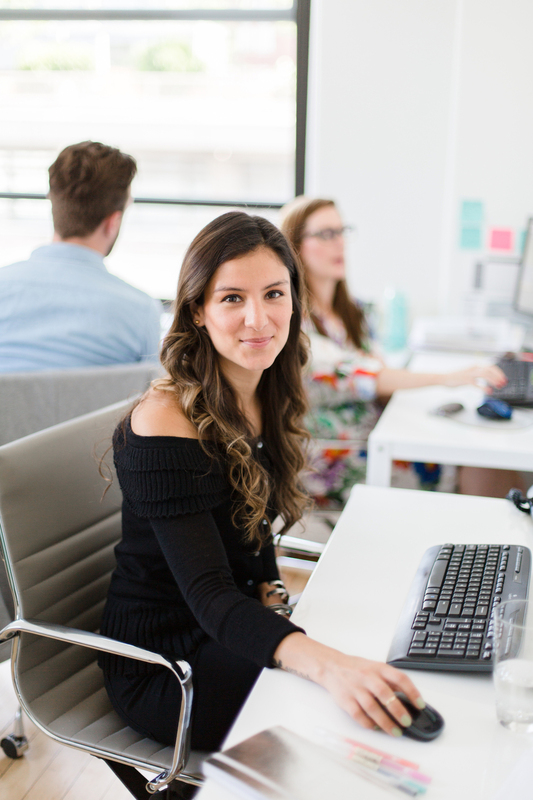 Earlier this year she shared a glimpse into her life here at The Brand Assembly Square in our team feature, and luckily for us, she recently let us shadow her around the office to get a better sense of her day-to-day in and around the Square. Today we're sharing the first part of our conversation with Anna as she preps for this week's Resort Market here in New York. Check out more of her insight below! Hi! I’m Anna. I joined the Brand Assembly team in January. Since then I have been working on reshaping my relationships with brands and buyers to reflect my new role. I come from the wholesale side of fashion so I’ve been getting the word out about how Brand Assembly is a resource to benefit buyers, designers and the fashion community. Walk us through your day-to-day at the office. As Brand Assembly’s Business Development Manager what are your primary responsibilities? I think of my role as having three main components; connecting the right buyers with emerging designers, curating our NY and LA space by scouting interesting and relevant collections, and assisting Hillary with our buy for the Brand Assembly shop in partnership with Lord & Taylor. More recently we teamed up with Poolside at The Montauk Beach House for an exclusive shop-in-shop all summer! We will also be throwing a Super Saturday one-day event on the lawn at the Beach House for press, designers, hotel guests, and pool partiers! That being said, it doesn’t matter what your role is when you are working at a startup, it is always all hands on deck! So on a day-to-day I have my main components that I focus on but any number of things can pull me in a different direction. One of the most unexpected discoveries I've made about myself while working at Brand Assembly, is how important it is to work with a team whose personal goals match that of the companies. We all aim to uphold a space that is fun, inviting, and conducive to growing a business. From buyers to colleagues to designers, Brand Assembly really is in the business of (connecting) people. Can you tell us a bit more about your interactions with these different industry professionals? How does working with these people reinforce your love of fashion? Working with emerging designers allows me to be close to every aspect of the business. It is inspiring to observe the designers as they perfect their craft and expand their business from season to season. I love the idea of being a part of the expansion of their distribution by connecting brands with buyers who are interested in discovering something new with the aesthetic and brand identity to coincide with their in-store curation. For me it’s not about randomly connecting people. It’s about understanding both sides of the business enough to make an introduction that will be mutually beneficial. Everybody wins!! When Resort Market starts what will we find you doing, wearing, and working on the most? You will find me running around like a crazy person and loving every minute of it! Market is when we get to reconnect with everyone face to face. At the Square I will be jumping in on market appointments as needed and facilitating new relationships between brands and buyers. In LA, I will be stationed right at the front of the show by check in to greet buyers and walk the show with them. In terms of what I will be wearing, you can most likely spot me in Ace & Jig or Morgan Carper at least once a week. When I am wearing Ace & Jig I feel like one of the cool kids, and Morgan Carpers' attention to detail always catches my eye. Currently what are your three go-to at work essentials? I am so not a “stuff” person but I do love my Brand Assembly notebook and colorful pens! My notebook looks like it belongs to a 5 year old since I usually write in a different color ink every day. I guess my other “must have” (at home and at work) is Burt’s Bees lip balm. I’m not a happy camper if I don’t have it so I stash them everywhere! Obviously Brand Assembly is all about making work (and fashion) fun! Do you have any tips on doing this both while at the office and when you’re off duty? Outside of work what has been fun for you lately? Yes, have wine on tap, stay late enough to hear Hillary play Whitney Houston’s greatest 80’s hits, and get Alex to tell you the sheep story. Outside of work, of course I can’t resist mentioning my dog-child Pepper. We enjoy long walks in the park and spending time with family. As a seasoned industry professional, what are your top three tips for those looking to break into the business side of fashion? Be persistent and don’t let someone tell you “this is the way it’s done”. Think of your own way to do things. Better ways!! In the fashion industry there is no time to procrastinate. We are always working on the next season. However, on the business side of things there is a lot of room for growth and innovation. Emerging designers and established name brands alike are looking for a new way to conduct business and stay relevant in this “fast fashion” market. You can’t be afraid to be creative and suggest something new out of fear of it not working, or causing a chuckle or two. How would you describe your “Brand Assembly Square street style” and if you could only come to work wearing three Brand Assembly designers who would you choose and why? Anyone who is currently stocking black. Kidding... (kind of). I’m always running around so I’m typically in flats and pieces that aren’t too fussy. I like to keep it simple and clean with maybe a subtle detail or a little something special. I am loving Öhlin/D and Bow&Arrow right now. They are two of our newest additions to The Brand Assembly Square. Öhlin/D reflects effortless individuality while maintaining a high ethical integrity within manufacturing and sourcing. Bow&Arrow is a collaborative jewelry project which helps sustain local craft in Southwestern Native American tribes. Leslie the owner, works directly with the artisans to bring traditional and one of a kind pieces to the advanced contemporary market without exploiting the craft by replicating and mass producing. In your role at Brand Assembly, what do you hope to assemble daily? Lasting relationships between up and coming designers and fabulous stores who aren’t afraid to set the trends and buy into something new. The larger department stores keep an eye on those trend setting boutiques to see what styles and designers to view next season. I believe that the market is shifting and consumers aren’t looking to buy something that everyone else is wearing just because it has a “brand name” associated with it. New York fashion consumers are looking for pieces that have a reason to take up precious real estate in their tiny NY closets. Pieces that are timeless and unique. Catch up with our team in real-time by following us on social @brandassembly to see what we're assembling daily!